높이 4m, 너비 10m의 ‘ㄱ’자 모양으로 꺾인 절벽암반에 여러 가지 모양을 새긴 바위그림이다. 바위에는 육지동물과 바다고기, 사냥하는 장면 등 총 200여점의 그림이 새겨져 있다. 육지동물은 호랑이, 멧돼지, 사슴 등이 묘사되어 있는데, 호랑이는 함정에 빠진 모습과 새끼를 밴 호랑이의 모습 등으로 표현되어 있다. 멧돼지는 교미하는 모습을 묘사하였고, 사슴은 새끼를 거느리거나 밴 모습 등으로 표현하였다. 바다고기는 작살 맞은 고래, 새끼를 배거나 데리고 다니는 고래의 모습 등으로 표현하였다. 사냥하는 장면은 탈을 쓴 무당, 짐승을 사냥하는 사냥꾼, 배를 타고 고래를 잡는 어부 등의 모습을 묘사하였으며, 그물이나 배의 모습도 표현하였다. 이러한 모습은 선사인들의 사냥활동이 원활하게 이루어지길 기원하며, 사냥감이 풍성해지길 바라는 마음으로 바위에 새긴 것이다. 조각기로 쪼아 윤곽선을 만들거나 전체를 떼어낸 기법, 쪼아낸 윤곽선을 갈아내는 기법의 사용으로 보아 신석기말에서 청동기시대에 제작되었을 것으로 추정된다. 선과 점을 이용하여 동물과 사냥장면을 생명력있게 표현하고 사물의 특징을 실감나게 묘사한 미술작품으로 사냥미술인 동시에 종교미술로서 선사시대 사람의 생활과 풍습을 알 수 있는 최고 걸작품으로 평가된다. 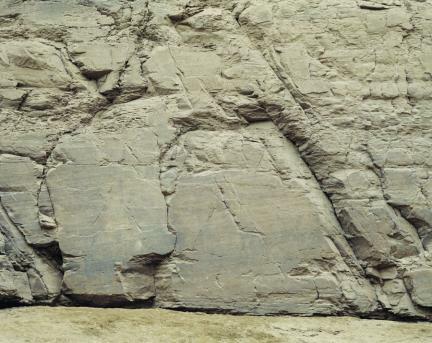 Petroglyphs, or stone engravings, refer to the drawings that men of the prehistoric age engraved on such sacred places as huge rocks with the hopes that their wishes might come true. It is known that stone engravings are related to the Southern culture. 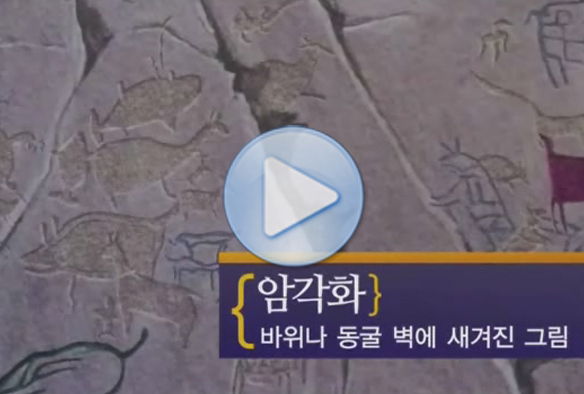 Such engravings discovered in the Korean peninsula give information on the origin and migration of the inhabitants. 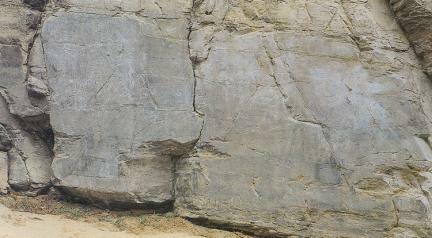 This stone engraving is 3m tall and 10m wide. 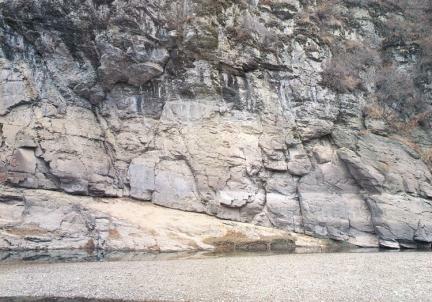 It is engraved on a rock that has the shape of the Korean alphabet 'ㄱ. 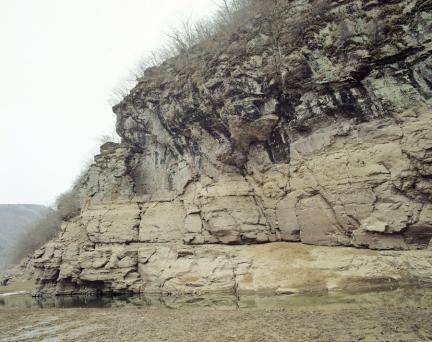 'Due to the construction works of Sayeon Dam, the engraving is presently underwater. 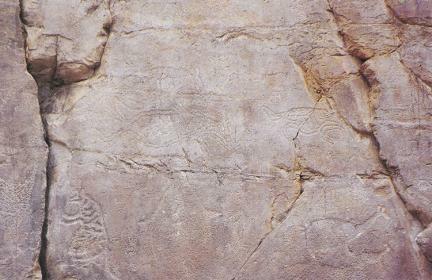 On the surface of the rock, a total of 200 drawings showing 75 kinds of land animals and sea animals and hunting scenes are engraved. There is a tiger caught in a trap and a female tiger heavy with child. Wild boars are captured in love making scenes and does can be seen either stalking with their babies by their sides or carrying them. Whales with spears in them, or carrying children can also be seen. The hunting scenes consist of masked magicians, hunters after their prey, and fishermen on board ships. Details such as fishing nets and the shape of the ships are all expressed. 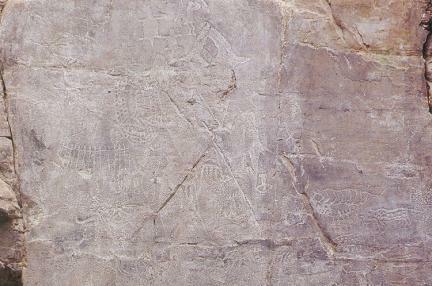 Supposedly these scenes were engraved in the hope that the hunts will be successful and the prey more abundant. The outlines of the drawings are chiseled out and grinded. 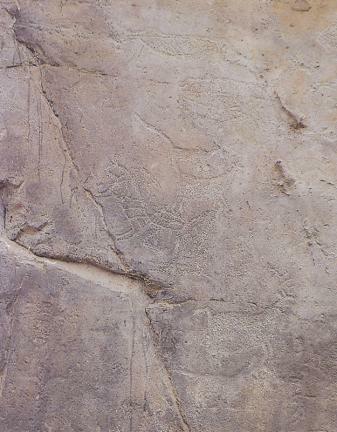 From these techniques, it seems that the stone engravings were made between the end of the Neolithic Age and the Bronze Age. The hunting scenes are made real and dynamic through the use of line and dots and on the whole, all the figures seem vivid and real. Being at the same time hunting art and religious art, they are excellent works from which the lives and customs of the prehistoric age can be known. 그림으로 쓴 역사책 '국보 반구대 암각화 물속에 잠깁니다' 전시회 현장을 가다!